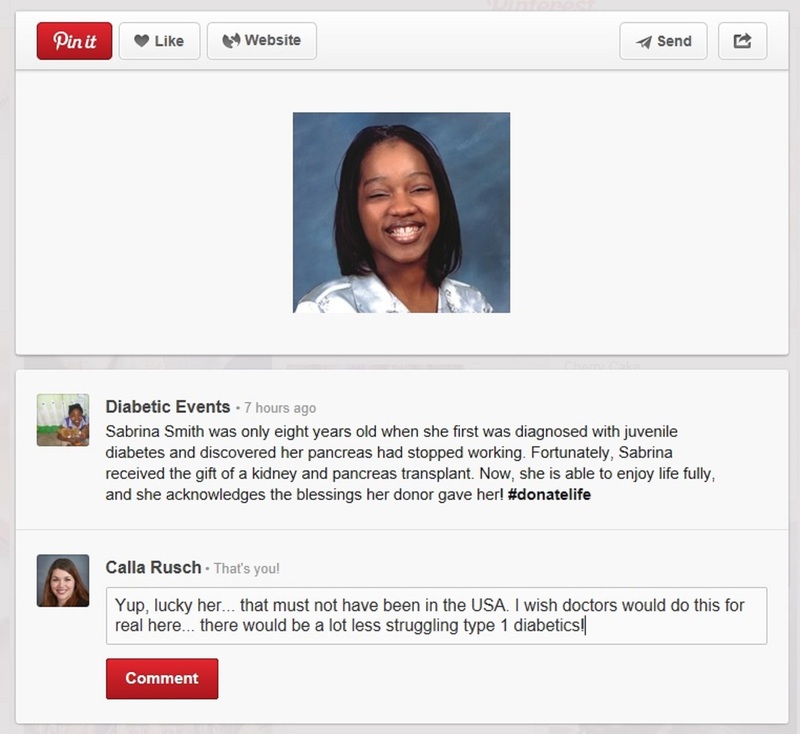 I love Pinterest, and have more recently been following a lot of boards that pertain to diabetes. I actually created a board of my own called I am a Type 1 Diabetic and I have gotten a lot of followers on it. Clearly, you can see my response on it… but how does this make you feel? I have looked into getting a pancreas transplant years ago, and I thought it was very dangerous and illegal in the United States. From what I am reading today, it seems that maybe that has changed. Most of the pancreas transplants that are done are also done with a kidney transplant. Read why here. I guess I flipped out at first because I am jealous that Sabrina can now live a diabetes-free lifestyle (only because her kidneys started to fail too). In all reality, I am happy that I am healthy enough to not need a major surgery to live. There seems to be many complications due to having a pancreas transplant, and many can be fatal. I was hoping that this could be a cure for all of us struggling out there, but at this point in time, it’s still just a hope that one day we will have a cure. Firstly, I just want to say thank you for your blog. I really appreciate you sharing your experience with type 1 diabetes. My 6 year old son was diagnosed nearly 4 months ago. Reading your blog gives me an insight into what it’s like for young adults. In regards to a pancreas transplant, the head endocronologist at the hospital my son was admitted to told us that a pancreas transplant is just too dangerous and not worth even considering. He mentioned how in some countries they perform them because they don’t have the high quality health care as we do in Australia, and I’m sure in the USA too. He gave the impression it was third world countries that did this. I wonder if that post on Pinterest is even real? To be honest with you, I wouldn’t want a pancreas transplant. That means immunosuppressants for the rest of your life (so your body doesn’t attack the new “foreign” organ) and any little illness or infection could become life-threatening. It’s generally done (around here, anyway) if the diabetes itself is so hard to control that it, in itself, is a big threat. As the previous commenter said, there are ways to control diabetes (though not without lots of effort!) here, so the greater risk is usually in the transplant. I do wonder, though, since it’s been determined that beta-cells can often regenerate if the autoimmune behavior is stopped, if the transplant is really needed with the immunosuppressants. Someone with more knowledge than I can probably answer that. I go through pin story and would not stop saying that now the age is full of technology . nothing is impossible. in the context of diabetes, our team of 20 years experienced doctors developed a tool Genetic Risk Assessment tool that helps in calculating genetic risk of diabetes, Even it tells the age when you can become diabetic… and helps you out to cure it before diabetes hit you! !